This is from a brand new story I’m writing! I don’t think I’ve mentioned it here, but I set a goal for myself that I would finish one piece of fiction every month for the next year. I like finishing things! I am on track to reach that goal — I finished “Crossing the Bridge” in January, Assassins in February, and “Blue Flowers” in March. But I’ve spent all of April mired in the black hole that is rewriting The Long Road. Now, that’s not a bad thing, but I needed a little variety. My fingers get itchy when they’re not writing narrative pieces after awhile. And I’ve had an idea bouncing around in my head: a set of detective stories featuring two elvish women in an on-again-off-again relationship. One is an assassin. 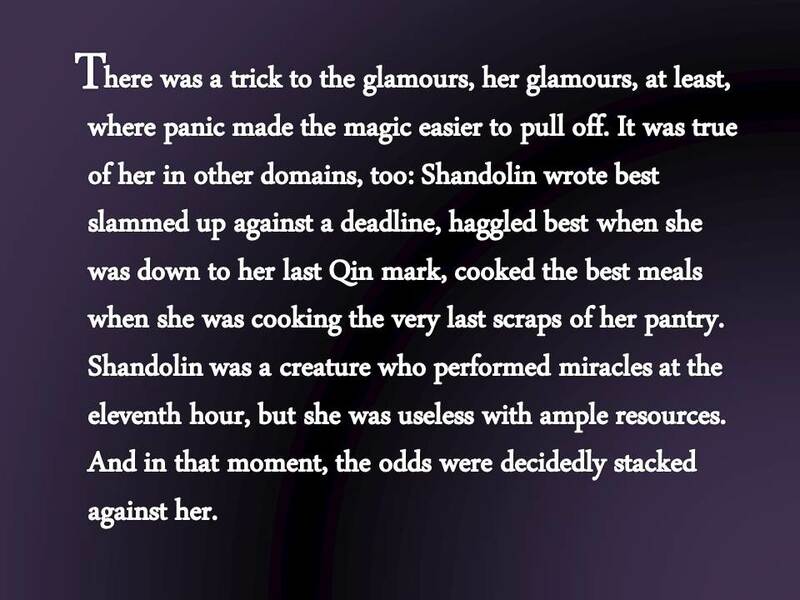 And the other, Shandolin, is a political firebrand. This story’s about two-thirds of the way through, so stay tuned because I’ll be needing beta readers for it by May 1st! This entry was posted in Aerdh, B's Novels, B's Short Fiction, PROOF, Queering Fantasy & SciFi, RESISTANCE, Writing is a Process, Writing Snippet and tagged Aerdh, fantasy, fiction, first drafts, gender, lgbt, LGBTQ, queer writing, sexuality, short fiction, short story, spec fic, writers, writing, writing process by brsanders. Bookmark the permalink.